The Bilderberg Group begins its annual meeting today in Dresden, Germany to discuss a range of hot button international issues. The four day meeting (June 9 to 12) has attracted protestors, many of whom believe that the Bilderberg annual meeting serves to expand the interests and influence of international banking cartels. A number of whistleblowers reveal a very different agenda behind the Bilderberg Group – a covert global takeover spearheaded by breakaway Nazi/German groups who allied themselves with extraterrestrials during the Second World War. To begin unraveling the Bilderberg mystery, a good place to start is with the dominant belief by many current protestors and critics that the Bilderberg meeting is a forum where world policies are secretly decided, and implemented. High among these policies is the creation of a One World Government and Central Bank dominated by corporate cartels. According to Bilderberg Group critics such as Daniel Estulin, author of The True Story of the Bilderberg Group, the annual meeting serves the interests of an international banking cartel intent on creating a One World Government and a global Central Bank. To achieve these long term goals, the Bilderberg Group meets annually to implement international policies where they secretly manipulate national politics, economics, and global events. The ultimate goals are all very worldly. The international banking families would provide much of the capital for setting up the World Central Bank thereby creating virtually unlimited wealth for future generations of international bankers. This wealth would be more than sufficient to satisfy the greed, ambitions, and political needs of international banking interests by controlling humanity. … they have gathered yearly in a luxurious hotel somewhere in the world to try to decide the future of humanity … the Bilderberg Group has grown beyond its idealistic beginnings to become a shadow world government, which decides in total secrecy at annual meetings how their plans are to be carried out. They threaten to take away our right to direct our own destinies. So is Estulin and other critics correct? Is the annual Bilderberg meeting merely a front for international banking interests that form the backbone of a shadow world government? The following story was told to me by a former hotel employee who had worked at a venue where the Bilderberg group had met one year. This was a year where Bill Clinton was in attendance (1991), according to this hotel staff member. I will simply refer to this person as Mr B. Having met Mr B, I found him to be very credible, and he had no reason to fabricate what follows. While at work during the Bilderberg annual meeting, Mr B was instructed to deliver an important message to a specific person attending a meeting in one of the smaller meeting rooms being used by the Bilderbergers. As is now well known, it is the tradition of the Bilderbergers to hire an entire hotel for its exclusive use during an annual meeting. All hotel staff are basically there to serve the needs of Bilderberg participants during the meeting. So it was not unusual for Mr B to be given such a task which he was now responsible to complete. Initially, Mr B was refused entry and was asked to hand the message over to someone else. Mr B insisted that he was under strict orders to deliver the message personally. After some heated discussion, Mr B was given permission to enter the meeting room. That’s when things became very bizarre. Mr B claimed that upon entering, he saw approximately 24 people seated around a large rectangular table. They were speaking in a cacophony of sounds, none of which was intelligible. It didn’t sound like any language Mr B had ever heard before. Mr B couldn’t see any faces among those seated around the table. He could see their physical bodies in suits, etc., but the faces were hazy due to some kind of mist or fog. Mr B reported that there was an intense energy field pervading the room – it was definitely very unusual and felt otherworldly to him. Mr B felt resentment being projected towards him over his unwelcome presence. He was directed towards the person to whom he had to deliver the message. Mr B delivered the message and promptly left the room. He was unaware of the message’s contents. Soon after leaving the room, Mr B experienced a massive headache, which lasted several days and he had to take time off. Mr B’s experience suggests that there is an element within the Bilderberg Group that does have an otherworldly composition and agenda. It’s very likely that Mr B had viewed the Bilderberg’s mysterious Steering Committee in session, and that the people running Bilderberg may be in touch with and/or controlled by an outside otherworldly force. To understand the Bilderberg connection to an otherworldly element, we need to turn the clock back a decade earlier, to events that occurred during World War II. A former US Navy Intelligence operative and aerospace engineer, William Tompkins, has revealed that U.S. Navy spies embedded within Nazi Germany’s advanced technology projects during the World War II had learned that the Nazi war effort was being assisted by extraterrestrial visitors. The spies had reported to a covert Naval Intelligence operation, located at Naval Air Station San Diego, that Adolf Hitler had signed a secret agreement with representatives of a Reptilian extraterrestrial race. They had, if you want to call them, “consultants”, who are Reptilian consultants assisting on all of these different things that it takes to design and build these spacecraft carriers, and propulsion systems. So this is an extremely well developed program and documented like crazy. Getting copies of the documents was hard for them, hard for our spies. This was an open program in the upper level of the SS. Holy cats the thing went way beyond that [world conquest]. Again, what we just said about this was the tip of the iceberg of what they were doing. Already Reptilians were doing it to other stars’ planets all over this area of the Galaxy…. These young kids, the operatives, they couldn’t believe half of what they brought back, what was going on. But some of them were really good people, and they knew how to get into places and listen to what’s going on, and finding what that guy he had talked to, or he heard, and going to so and so, because yes they were doing that over there. When Vril was building that first craft, the Vril had one or two of the aliens that worked with them in Germany where they fired rockets from Peenemunde. The documents I read in Washington said that’s where the first Vril vehicle was made…. They [aliens] were helpers to Germany. More recently, Secret Space Program whistleblower, Corey Goode says that from 1987 to 2007, he read intelligence briefings on smart-glass pads that detailed what had happened during World War II. He describes how German Secret Societies were helped before and throughout World War II by a group of Reptilian extraterrestrials known as Draconians, who were assisting the Germans in the development of advanced antigravity space battle fleets. At the same time these [German Secret] Societies had made contact with the Draco Federation and another group that avoided the Draco’s. The German Occultists were very busy from the early 1900’s, especially in the time just before, during and after World War One. Their major breakthrough’s occurred in the late 1930’s. Similar to Tompkins, Goode also said that the ultimate goal of the Reptilians, in helping German Secret Societies and the Nazi SS, was to create advanced space carrier groups that would be capable of interplanetary conquest. 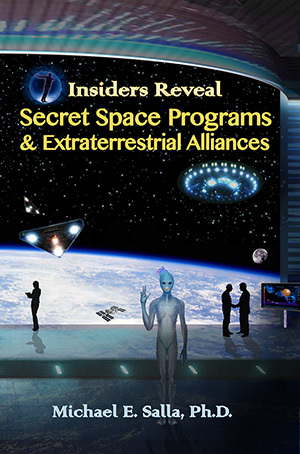 The eventual German/Nazi space battle groups became what Goode described as the “Dark Fleet.” It operates outside of our solar system, and is described at length in the book, Insiders Reveal Secret Space Programs and Extraterrestrial Alliances. The first Bilderberg meeting was held in May 1954. The public justification was that it was held to promote political and economic cooperation between Europe and North America as the best defense to what was now perceived as the long term threat of communism. To that end, prominent business and political leaders have been regularly invited to the Bilderberg Group meeting on an annual basis to discuss ways of coordinating national policies and anticipating global trends. The real reason for the formation of the Bilderberg Group, however, can be traced to waves of flying saucer sightings over key U.S. cities in 1952. 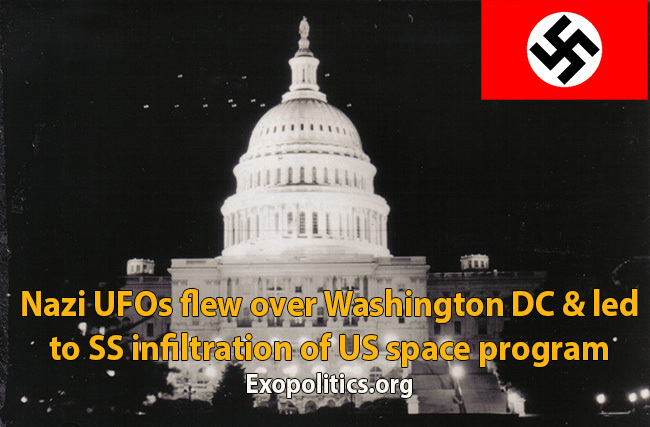 The overflights of Washington DC in the summer of 1952 were the most important because according to independent whistleblowers, these involved Nazi flying saucers operating out of hidden bases in Antarctica. … after the failed Operation High Jump Mission, the Operation Paperclip Scientists were asked to negotiate meetings… The NAZI’s used this to their advantage in some very public sorties over Washington D.C. and highly Secret Atomic Warfare Bases to mention a few. Eisenhower finally relented and signed a treaty with them … “NAZI Occult Societies” therefore infiltrated every single high tech corporation and position of power inside the now “Joint Break Away Civilization/Program”. They have been involved in all western space programs and projects ever since. The over flights of advance very swift crafts over Washington, DC were these German advanced aircraft that totally out flew American advanced crafts. On July 12, 1952, President Truman observed several of the UFOs and was completely amazed by their capabilities of outmaneuvering the USAF and US Navy advanced Jet fighter, the F-4D. USA jets sent up to bring one down. None could fly the speed of the German Saucers. Similarly, William Tompkins describes in his book, Selected by Extraterrestrials, infiltration of the U.S. military industrial complex by Nazis and their Reptilian allies. Secret agreements between the breakaway Nazi/German group in Antarctica and the Truman/Eisenhower administrations allowed the infiltration of the U.S. military industrial complex. The infiltration occurred through scientific, financial, and political processes. The scientific infiltration occurred through Operation Paperclip where thousands of former Nazi scientists were placed in positions of authority within the military industrial complex. For example, Kurt Debus became the first director of the Kennedy Space Center in 1962, and had regular meetings with senior SS officials such as Hans Kammler who survived the War. Clark McClelland reports having seen Kammler at the Kennedy Space Center during the 1960s. The financial infiltration would occur through massive amounts of Nazi capital that had been allowed to leave Germany in the summer of 1944. The “Red House Report” is a U.S. Army Intelligence document that confirms that on August 10, 1944, after the Normandy landing, Martin Bormann had given secret orders to leading German industrialists to move their liquid capital to neutral countries in order to help resurrect the Nazi regime after its impending military defeat. In short, the Red House Report is hard evidence of Bormann’s plan to set up a covert “Fourth Reich” through economic means after military hostilities had ceased. The political process coincided with the May 1954 formation of the Bilderberg Group, which involved key figures from North American and European political, and corporate elite. The Bilderberg Group was either a direct result of the breakaway German/Nazi regime secretly setting it up through pro-Nazi figures such as Prince Bernard of the Netherlands, or was co-opted by the Nazi/German breakaway groups through their extraterrestrial allies who would come to dominate the Steering Committee. The otherworldly incident described above by Mr B demonstrates how the Steering Committee was at some point taken over by extraterrestrials, very likely the Reptilian group that had allied itself with Hitler and German secret societies. Another incident provides further evidence that it was indeed Reptilians who had powerful influence over the Bilderberg Group. In a July 2015 briefing received by Goode from a Lt. Col. Gonzales (another secret space program whistleblower who continues to remain anonymous), Goode described that one of the principal architects of the Bilderberg Group, Henry Kissinger, was involved in a meeting involving a 14 foot Draconian extraterrestrial. Gonzales and his Security Team came out into a hall way and it seemed empty and quiet except the Security/IE’s motioned down the hall with hand signals where they felt the awaiting delegation. When they were most of the way to the end of the hall Gonzales saw a very familiar person. He said this person had to have seen the look on his face and his gaping open mouth. This person introduced himself with his thick accent, droopy eyes and curly white hair. Gonzales said this guy had created so many think tanks, global organizations and advised more U.S. Presidents than anyone he could think of. This person is very well known as a supporter of the New World Order and Depopulation Programs. Goode’s description is referring to Kissinger, who has long been rumored to be a key figure in classified extraterrestrial related projects. Kissinger attended the 2015 Bilderberg Group meeting, which occurred only two days after Goode and Gonzales had allegedly met approximately 200 human elites that offered a limited disclosure program to begin in November 2015. Kissinger will also be attending the 2016 Bilderberg meeting in Dresden. Dresden is very symbolic since it was utterly destroyed during the Second World War. Holding the Bilderberg meeting there represents a Phoenix-like return of key elements of the Third Reich in a reconstituted Fourth Reich. 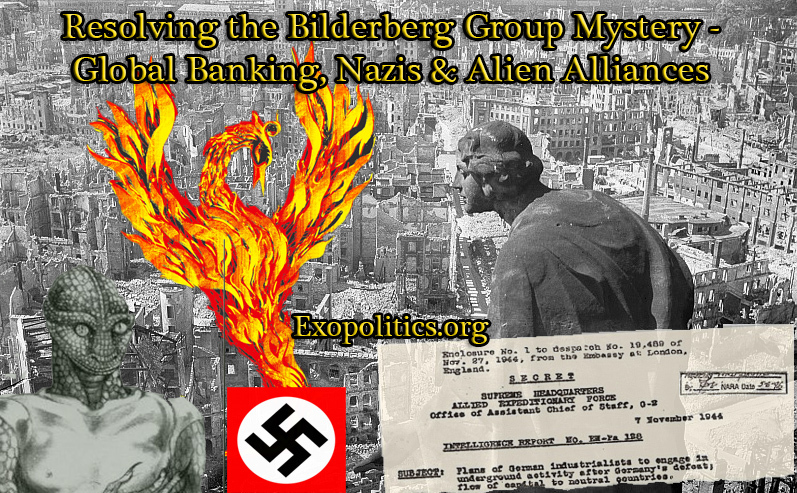 Consequently, the current Bilderberg Group meeting provides a further opportunity for the breakaway Nazi/German group and their Reptilian allies to move forward in their covert plan to dominate global events through a centralized global order. Some even believe we are part of a secret cabal working against the best interests of the United States, characterizing my family and me as ‘internationalists’ and of conspiring with others around the world to build a more integrated global political and economic structure — one world, if you will. If that is the charge, I stand guilty, and I am proud of it. It’s worth emphasizing that elite global interests intimately involved in the Bilderberg Group have very different goals to the global interests of humanity. A centralized system of world governance that Bilderbergers such as Kissinger and Rockefeller support, is little more than a resurrected Fourth Reich. 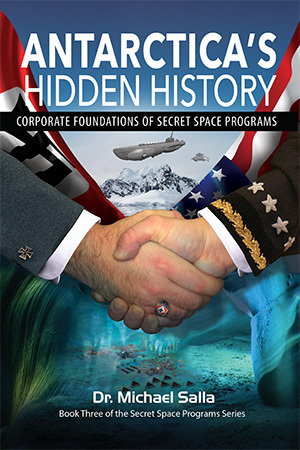 Casting light on the historic processes that led to the creation of the Bilderberg Group is a step in the right direction for learning about the emergence of a breakaway German/Nazi group in Antarctica, the multiple secret space programs that exist today, and key extraterrestrial alliances that greatly influence humanity’s future.